Socrates was an ancient Greek philosopher who is widely credited for laying the foundation for Western philosophy. He was born and lived in Athens, where he spent most of his time in enthusiastic pursuit of wisdom (philospophy). He "followed the argument" in his personal reflection, and in a sustained and rigorous dialogue between friends, followers, and contemporary itinerant teachers of wisdom. Later in his life he became known as the wisest man in all of Greece. Opinions about Socrates were widely polarized, drawing very high praise or very severe ridicule. He had many devoted followers (such as Plato), and many angry detractors. As an old man, he fell into grave disrepute with the Athenian state powers, and was commanded to stop his public disputes, and his associations with young aristocrats. He carried on as usual. Finally, he was arrested and accused of corrupting the youth, inventing new deities (heresy), and disbelieving in the divine (atheism). According to traditional accounts, he was sentenced to die by drinking poison. Presented with an opportunity to leave Athens, he believed it would be more honorable to stay in his home country. Therefore, at the age of 70, he drank the hemlock and died. Most of what is known about Socrates is derived from information that recurs across various contemporary sources: the dialogues written by Plato, one of Socrates' students; the works of Xenophon, one of his contemporaries; and writings by Aristophanes and Aristotle. Anything Socrates wrote himself has not survived. Additionally, Aristophanes' account of Socrates is in fact a satirical attack on philosophers and does not purport to be a factual account of events in the life of Socrates. Another complication is the Ancient Greek tradition of scholars attributing their own ideas, theories and sometimes even personal traits to their mentors, a tradition Plato appears to have followed. Gabriele Giannantoni, in his monumental 1991 work Socratis et Socraticorum Reliquiae, attempts to compile every scrap of evidence regarding Socrates, including material attributed to Aeschines Socraticus, Antisthenes and a number of others supposed to have known him. According to accounts from antiquity, Socrates' father was the sculptor Sophroniscus and his mother Phaenarete, a midwife. Socrates married Xanthippe, who bore him three sons – Lamprocles, Sophroniscus and Menexenus – who were all quite young at the time of his death. Traditionally, Xanthippe is thought to have been an ill-tempered scold, mainly due to her characterization by Xenophon. It is unclear how Socrates earned a living. According to Xenophon's Symposium, Socrates is reported as saying he devotes himself only to what he regards as the most important art or occupation: discussing philosophy. Although he inherited money following his father's death, it is unlikely it was sufficient to keep him for long. Xenophon and Aristophanes respectively portray Socrates as accepting payment for teaching and running a sophist school with Chaerephon, whilst in Plato's Symposium Socrates explicitly denies accepting payment for teaching. It is possible Socrates relied on the generosity of wealthy and powerful friends such as Crito. Characters such as Alcibiades – the name of one of Socrates' friends – in the dialogues indicate that Socrates served in the Athenian army during the Peloponnesian War. Plato's Symposium indicates that he was also decorated for bravery. In one instance, Socrates is said to have stayed on the battlefield to protect Alcibiades, probably saving his life; he then sought Alcibiades' recognition rather than accepting any of his own. It is also claimed he showed great heartiness during these military campaigns, such as walking without shoes or coat during winter. Socrates lived during the time of the transition from the height of the Athenian Empire to its decline after its defeat by Sparta and its allies in the Peloponnesian War. At a time when Athens was seeking to stabilize and recover from its humiliating defeat, the Athenian public court was induced by three leading public figures to try Socrates for impiety and for corrupting the youth of Athens. This was a time in culture when the Greeks thought of gods and goddesses as being associated with protecting particular cities. Athens, for instance, is named after its protecting goddess Athena. The defeat of Athens in the Peloponnesian War was interpreted as Athena judging the city for not being pious. The last thing Athens needed was more punishment from Athena for one man inciting its citizens to question her or the other gods. In the Apology, Socrates insists that this is a false charge. According to the version of his defense speech presented in Plato's Apology, Socrates' life as the "gadfly" of Athens began when his friend Chaerephon asked the oracle at Delphi if anyone was wiser than Socrates; the Oracle responded negatively. Socrates, interpreting this as a riddle, set out to find men who were wiser than he was. He questioned the men of Athens about their knowledge of good, beauty, and virtue. Finding that they knew nothing and yet believed themselves to know much, Socrates came to the conclusion that he was wise only in so far as he knew that he knew nothing. Socrates' superior intellect made the prominent Athenians he publicly questioned look foolish, turning them against him and leading to accusations of wrongdoing. He was nevertheless found guilty as charged, and sentenced to death by drinking a silver goblet of hemlock. Socrates turned down the pleas of his disciples to attempt an escape from prison, drinking the hemlock and dying in the company of his friends. According to the Phaedo, Socrates had a calm death, enduring his sentence with fortitude. The Roman philosopher Seneca attempted to emulate Socrates' death by hemlock when forced to commit suicide by the Emperor Nero. According to Xenophon and Plato, Socrates had an opportunity to escape, as his followers were able to bribe the prison guards. After escaping, Socrates would have had to flee from Athens. In the painting "Death Of Socrates", under the death bed, there is an irregularly-shaped tile, which many believe is an escape hatch. Socrates refused to escape for several reasons. 1. He believed that such a flight would indicate a fear of death, which he believed no true philosopher has. 2. Even if he did leave, he, and his teaching, would fare no better in another country. 3. Having knowingly agreed to live under the city's laws, he implicitly subjected himself to the possibility of being accused of crimes by its citizens and judged guilty by its jury. To do otherwise would have caused him to break his 'contract' with the state, and by so doing harming it, an act contrary to Socratic principle. After Socrates's death, Plato described it in the dialogue Phaedo. "He walked about and, when he said his legs were heavy, lay down on his back, for such was the advice of the attendant. The man who had administered the poison laid his hands on him and after a while examined his feet and legs, then pinched his foot hard and asked if he felt it. He said "No"; then after that, his thighs; and passing upwards in this way he showed us that he was growing cold and rigid. And again he touched him and said that when it reached his heart, he would be gone. ... To this question he made no reply, but after a little while he moved; the attendant uncovered him; his eyes were fixed." Perhaps his most important contribution to Western thought is his dialectic (answering a question with a question) method of inquiry, known as the Socratic Method or method of elenchos, which he largely applied to the examination of key moral concepts such as the Good and Justice. It was first described by Plato in the Socratic Dialogues. For this, Socrates is customarily regarded as the father of political philosophy and ethics or moral philosophy, and as a fountainhead of all the main themes in Western philosophy in general. The beliefs of Socrates, as opposed to those of Plato, are difficult to discern. Little in the way of concrete evidence demarcates the two. There are some who claim that Socrates had no particular set of beliefs, and sought only to examine; the lengthy theories he gives in the Republic are considered to be the thoughts of Plato. Others argue that he did have his own theories and beliefs, but there is much controversy over what these might have been, owing to the difficulty of separating Socrates from Plato and the difficulty of interpreting even the dramatic writings concerning Socrates. Consequently, distinguishing the philosophical beliefs of Socrates from those of Plato and Xenophon is not easy and it must be remembered that what is attributed to Socrates might more closely reflect the specific concerns of these writers. Evidence from the dialogues suggests Socrates had only two teachers: Prodicus, a grammarian, and Diotima, a priestess from Mantinea who taught him about eros, or love. His knowledge of other contemporary thinkers such as Parmenides and Anaxagoras is evident from a number of dialogues, and historical sources often include both of them as Socrates' teachers. John Burnet argued that his principal teacher was the Anaxagroean Archelaus but that his ideas were as Plato described them; Eric A. Havelock, on the other hand, considered Socrates' association with the Anaxagoreans to be evidence of Plato's philosophical separation from Socrates. Apollo himself may be considered one of his teachers, as Socrates claims (in Plato's Apology) that his habit of constant conversation was obedience to God. See below for more on the divine sign. Socrates seems to have often said that his wisdom was limited to an awareness of his own ignorance. Socrates may have believed that wrongdoing was a consequence of ignorance, that those who did wrong knew no better. The one thing Socrates consistently claimed to have knowledge of was "the art of love" which he connected with the concept of "the love of wisdom", i.e., philosophy. He never actually claimed to be wise, only to understand the path that a lover of wisdom must take in pursuing it. It is debatable whether Socrates believed that humans (as opposed to gods like Apollo) could actually become wise. On the one hand, he drew a clear line between human ignorance and ideal knowledge; on the other, Plato's Symposium (Diotima's Speech) and Republic (Allegory of the Cave) describe a method for ascending to wisdom. In Plato's Theaetetus (150a) Socrates compares himself to a true matchmaker, as distinguished from a panderer. This distinction is echoed in Xenophon's Symposium (3.20), when Socrates jokes about his certainty of being able to make a fortune, if he chose to practise the art of pandering. For his part as a philosophical interlocutor, he leads his respondent to a clearer conception of wisdom, although he claims that he is not himself a teacher (Apology). His role, he claims, is more properly to be understood as analogous to a midwife (µa?a). Socrates explains that he is himself barren of theories, but knows how to bring the theories of others to birth and determine whether they are worthy or mere "wind eggs". Perhaps significantly, he points out that midwives are barren due to age, and women who have never given birth are unable to become midwives; a truly barren woman would have no experience or knowledge of birth and would be unable to separate the worthy infants from those that should be left on the hillside to be exposed. To judge this, the midwife must have experience and knowledge of what she is judging. Socrates believed that the best way for people to live was to focus on self-development rather than the pursuit of material wealth. He always invited others to try to concentrate more on friendships and a sense of true community, for Socrates felt that this was the best way for people to grow together as a populace. His actions lived up to this: in the end, Socrates accepted his death sentence when most thought he would simply leave Athens, as he felt he could not run away from or go against the will of his community; as above, his reputation for valor on the battlefield was without reproach. Ultimately, virtue relates to the form of the Good; to truly be good and not just act with "right opinion"; one must come to know the unchanging Good in itself. In the Republic, he describes the "divided line", a continuum of ignorance to knowledge with the Good on top of it all; only at the top of this line do we find true good and the knowledge of such. It is often argued that Socrates believed "ideals belong in a world that only the wise man can understand" making the philosopher the only type of person suitable to govern others. According to Plato's account, Socrates was in no way subtle about his particular beliefs on government. He openly objected to the democracy that ran Athens during his adult life. It was not only Athenian democracy: Socrates objected to any form of government that did not conform to his ideal of a perfect republic led by philosophers (Solomon 49), and Athenian government was far from that. During the last years of Socrates' life, Athens was in continual flux due to political upheaval. Democracy was at last overthrown by a junta known as the Thirty Tyrants, led by Plato's relative, Critias, who had been a student of Socrates. The Tyrants ruled for about a year before the Athenian democracy was reinstated, at which point it declared an amnesty for all recent events. Four years later, it acted to silence the voice of Socrates. This argument is often denied, and the question is one of the biggest philosophical debates when trying to determine what, exactly, it was that Socrates believed. The strongest argument of those who claim that Socrates did not actually believe in the idea of philosopher kings is Socrates' constant refusal to enter into politics or participate in government of any sort; he often stated that he could not look into other matters or tell people how to live when he did not yet understand himself. He believed he was a philosopher engaged in the pursuit of Truth, and did not claim to know it fully. Socrates' acceptance of his death sentence, after his conviction by the Boule (Senate), can also support this view. It is often claimed that much of the anti-democratic leanings are from Plato, who was never able to overcome his disgust at what was done to his teacher. In any case, it is clear that Socrates thought that the rule of the Thirty Tyrants was at least as objectionable as democracy; when called before them to assist in the arrest of a fellow Athenian, Socrates refused and narrowly escaped death before the Tyrants were overthrown. He did however fulfill his duty to serve as prytanie when a trial of a group of generals who presided over a disastrous naval campaign were judged; even then he maintained an uncompromising attitude, being one of those who refused to proceed in a manner not supported by the laws, despite intense pressure. Judging by his actions, he considered the rule of the Thirty Tyrants less legitimate than that of the democratic senate who sentenced him to death. As depicted in the dialogues of Plato, Socrates often seems to manifest a mystical side, discussing reincarnation and the mystery religions; however, this is generally attributed to Plato. Regardless, this cannot be dismissed out of hand, as we cannot be sure of the differences between the views of Plato and Socrates; in addition, there seem to be some corollaries in the works of Xenophon. In the culmination of the philosophic path as discussed in Plato's Symposium and Republic, one comes to the Sea of Beauty or to the sight of the form of the Good in an experience akin to mystical revelation; only then can one become wise. 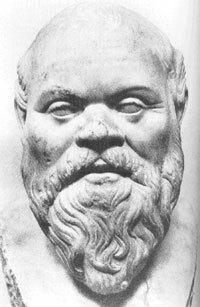 (In the Symposium, Socrates credits his speech on the philosophic path to his teacher, the priestess Diotima, who is not even sure if Socrates is capable of reaching the highest mysteries). In the Meno, he refers to the Eleusinian Mysteries, telling Meno he would understand Socrates' answers better if only he could stay for the initiations next week. Perhaps the most interesting facet of this is Socrates' reliance on what the Greeks called his "daemonic sign", an averting (?p?t?ept????) inner voice that Socrates heard only when Socrates was about to make a mistake. It was this sign that prevented Socrates from entering into politics. In the Phaedrus, we are told Socrates considered this to be a form of "divine madness", the sort of insanity that is a gift from the gods and gives us poetry, mysticism, love, and even philosophy itself. Alternately, the sign is often taken to be what we would call "intuition"; however, Socrates' characterization of the phenomenon as "daemonic" suggests that its origin is divine, mysterious, and independent of his own thoughts. He was prominently lampooned in Aristophanes' comedy The Clouds, produced when Socrates was in his mid-forties; he said at his trial (in Plato's version) that the laughter of the theater was a harder task to answer than the arguments of his accusers. In the play he is ridiculed for his dirtiness, which is associated with the Laconizing fad; also in plays by Callias, Eupolis, and Telecleides. In all of these, Socrates and the Sophists were criticised for "the moral dangers inherent in contemporary thought and literature". Plato, Xenophon, and Aristotle are the main sources for the historical Socrates; however, Xenophon and Plato were direct disciples of Socrates, and presumably, they idealize him; however, they wrote the only continuous descriptions of Socrates that have come down to us. Aristotle refers frequently, but in passing, to Socrates in his writings. Almost all of Plato's works center around Socrates. However Plato's latter works appear to be more his own philosophy put into the mouth of his mentor. The Apology professes to be a record of the actual speech that Socrates delivered in his own defense at the trial. In the Athenian jury system, an Apology is composed of three parts: a speech, followed by a counter-assessment, then some final words. "Apology" is a transliteration, not a translation, of the Greek apologia, meaning "defense"; in this sense it is not apologetic according to our contemporary use of the term. Especially for Plato's writings referring to Socrates, it is not always clear which ideas brought forward by Socrates (or his friends) actually belonged to Socrates and which of these may have been new additions or elaborations by Plato — this is known as the Socratic problem. Generally, the early works of Plato are considered to be close to the spirit of Socrates, whereas the later works — including Phaedo and the "Republic" — are considered to be possibly products of Plato's elaborations.